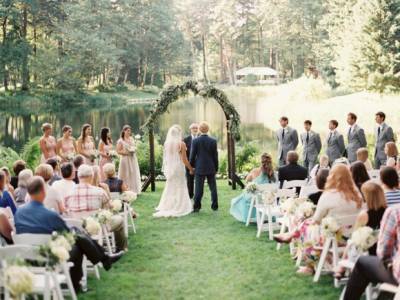 With a gorgeous outdoor venue just outside or Portland in the Columbia Gorge, Whitney & Mike were spoilt with a lot of natural beauty offering them the simple organic look they were after. As many of their guests had travelled quite a distance to celebrate with them, they wanted to create an intimate atmosphere with a family style dinner by candlelight. They also provided them with welcome bags going the extra mile to ensure everyone had a great experience in the area. �In true Portland tradition, the food was the highlight of the weekend. The rehearsal dinner menu featured paella and warm banana-cream cheese malassadas, while the reception menu featured beef brisket with smoky BBQ sauce, white cheddar grits, and banana pudding, served family style, a nod to the groom's southern heritage. Our guests are still raving about the food.� Thanks for LAUREN LIDDELL for sending this gorgeous wedding our way� what a stunning job she did of capturing it all! HOW DID YOU MEET? Mike and I met through work. We are both engineers, and I moved to his hometown a few years ago where I knew no one. Mike went out of his way to make me feel welcome by inviting me out with his friends, and over time we discovered we share a similar sense of humor. Eventually our friendship turned into romance, and� now we're married! TELL US ABOUT YOUR PROPOSAL: We got engaged on a beach in Honduras. We had a guide, who happened to be 12 years old, showing us around the island of Roatan. Despite Mike's best efforts to "lose him" on the beach, the kid was incredibly persistent about sticking near us. Eventually, Mike gave up and proposed in the kid's presence. Also, it was raining and locals kept trying to sell us stuff during the proposal, but at least it makes for a funny story in retrospect! 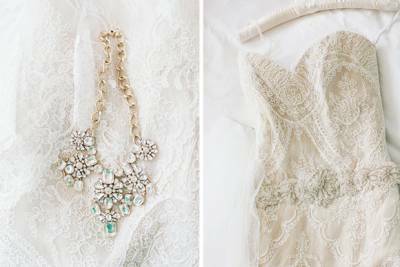 TELL US ABOUT FINDING YOUR WEDDING DRESS: I'm not a super sentimental person, so finding the dress isn't a particularly romantic story. I had tried on dresses with my Maid of Honor and my parents, but when I actually picked and purchased my dress, I was actually just on Skype with my mom since we live across the country from each other. Not too many tears were shed, but I am still in love with my dress choice. As for my reception dress, I actually rented that one using Rent the Runway. I didn't decide whether to wear it or not until the morning of the wedding, but it was crazy comfortable and I figured I wouldn't have too many opportunities in the future to wear a dress that sparkly again. FAVOURITE DETAIL OF THE DAY: During the reception, guests played lawn games and took canoes out on the lake. I grew up going to summer camp in the northwest and the feeling was very nostalgic. Our coordinator, Luxe, also did a beautiful job styling our sweetheart table and lounge area. WHAT ADVISE WOULD YOU GIVE OUT TO A COUPLE PLANNING THEIR WEDDING? Stop working on wedding tasks at least 24 hrs prior to your wedding, especially if you have a lot of DIY elements. It was such a relief to stop worrying about details before the rehearsal dinner and just let go and really enjoy the night before our wedding day with friends and family. Also, don't lose any sleep over the weather (you have plenty of other things to think about) and hire a coordinator! MOST MEMORABLE MOMENT? Being surrounded by friends and family, ages 3 to 93, breaking it down on the dance floor at the end of the night. My dad broke out in Gangnam Style halfway through the night and got the whole crowd dancing. A synchronized dance to Abba's Dancing Queen may have also went down.